Bugsy is the Azalea Town Gym Leader. As a young trainer, many people have been known to mistaken Bugsy for a girl. 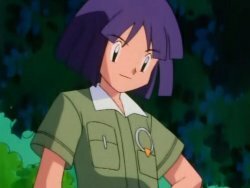 However, despite his age, Bugsy is an incredibly capable battler and incredibly knowledgable about Pokémon. With Bug Pokémon as his specialty, Bugsy is often seen in trees overlooking them. Bugsy is a kind person and incredibly polite to anyone he meets, addressing them formally until he gets to know them. Bugsy has worked up the ranks and become the Azalea Town Gym Leader. 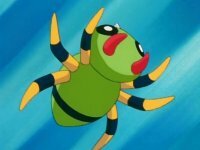 Bugsy's Spinarak was only seen briefly in battle. Originally managing to stop Cyndaquil in it's tracks in battle using it's String Shot Attacks, Ash decided to send in Chikorita. With Chikorita's agile speed, it was able to dodge Spinarak's attacks and eventually knocked it out. 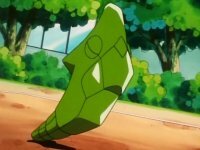 Metapod, considering the docile nature of the other Metapods around the world, is a rather strong Pokémon. First using it's harden to defend from attacks, it then manages to use a powerful Tackle, powered through its Harden, to defeat the Pokémon it is against. A Worthy Pokémon indeed. Scyther is Bugsy's Secret weapon and his powerhouse. 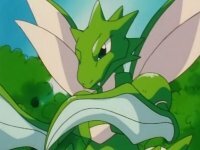 Using it's Swords Dance attack, Scyther is invulnerable to horizontal fire attacks, stopping many of the Pokémon it goes against from doing any damage. Teamed with some powerful attacks, Scyther is definitely the strongest of Bugsy's Pokémon.